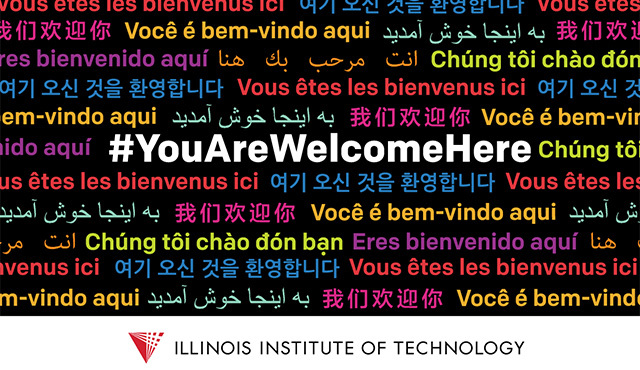 International applicants who are interested in attending Illinois Tech, and who meet academic and financial requirements but do not meet the minimum English proficiency test requirements, may be offered conditional admission. This allows students to increase English language proficiency through intense English-language programs before taking academic coursework at Illinois Tech. Students who will not submit TOEFL or IELTS scores should indicate an interest in conditional admission on their Common Application. Students who meet academic requirements will be granted conditional admission and automatically admitted to the Intensive English Program at Illinois Tech. Students must still complete all other admission requirements. Students who are granted conditional English admission will automatically be admitted to the Intensive English Program at Illinois Tech. The length of participation in the program will depend on one’s own English comprehension and vary based on starting proficiency. Please note that students who wish to attend one of our other partner institutions must apply to those programs individually. Students who are granted conditional English admission will automatically be admitted to the Intensive English Program (IEP) at Illinois Tech. Students accepted to the IEP will study English, meet new people from different countries and cultures, and will experience Chicago while preparing for their academic and professional careers. Students in the IEP program will be able to live on Illinois Tech’s campus and take advantage of various student resources while increasing their language skills. Upon completion of the “Advanced” level at IEP, students will be granted unconditional admission to Illinois Tech and able to enroll in academic coursework. For more information about the IEP program or view the IEP brochure. Students who choose to attend a partner institution rather than Tech’s IEP must email their admission counselor directly and confirm which partner school they are attending. For any students who are currently studying at KIC, ELS, or TLC, you will be offered a TOEFL/IELTS waiver after you completed the above levels of proficiency. You must submit the certificate of completion along with your application. You will still need to complete all other additional admission requirements and will be held to the same academic standard as all incoming prospective students. Complete the Common Application. There is no application fee to apply to Illinois Tech. Fall 2018 Applications are now closed. The 2019 Common App is open. Submit marks or grades of courses completed prior to university or college entrance, as well as all board examination scores. We require at least three years of marks/grades upon submission of the application to be reviewed for admission. Your transcripts can be uploaded electronically through your application tracker or submitted through the Common Application. Provide a completed evaluation form or letter of recommendation from your counselor or a teacher (especially in the subjects of math, science, or English). One letter is required but up to three are accepted. Students applying for conditional admission do not need to submit TOEFL or IELTS scores if you specify on your application that you are interested in conditional admission. Students do not need to provide the Financial Affidavit of Support or a passport copy to the admission office; however, students who are granted conditional admission will need to submit these documents either to Illinois Tech’s IEP or to the partner language institution they plan to enroll in. Submit official or certified copies of your transcript(s) from all universities/colleges you have attended to the Office of Undergraduate Admission. Provide course descriptions or syllabi of courses completed at the university level. These descriptions must be translated into English. Unofficial translations of transcripts are not accepted, but students may translate their course descriptions themselves. A student who has completed fewer than 30 credit hours (or the equivalent of one year of full-time study) at the university level must also complete the first-year application requirements.